Me and Bonnie, my regular, in the garden! 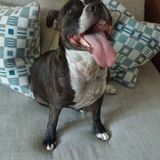 Hi i'm Janet, and I'd love to help look after your four legged friends! I'm a full time dog sitter and walker in the Bexley area so can help with all your canine needs including overnight boarding and walking . Your furry friends will be in safe hands in a child free, pet free home, with a large enclosed garden. I also live very close to a woodland area and a park for walkies. Please feel free to contact me for more information or for an informal chat if you have any dates in mind. Please note I also hold a current DBS check certificate which I can provide on request. 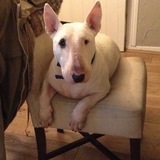 Janet took great care of Bully who as a rescue Bull Terrier can be a real challenge. We met at Janet's home before going away to discuss all things Bully and she takes great pains to replicate a dogs routines at home even to the extent of letting our smelly, 30kg hound up on her bed for morning cuddles. He has come home fit and happy, what more could we ask? Janet was brilliant we took Potter round the week before and Potter was at home straight away. We felt Janet had a good understanding of dogs. Would be happy to recommend Janet to other dog owners.